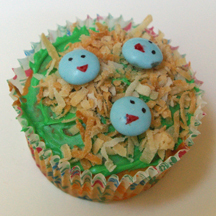 Three bluebirds await their mama bird in a nest on this cupcake, which features toasted coconut. What You Need: 1 cupcake; frosting tinted green; toasted coconut; 3 pastel blue M&Ms; food-safe markers. How to Make It: Toast coconut for 5-10 minutes in 350-degree oven. Let cool. Frost cupcake green. Sprinkle center with coconut for nest. Use food-safe markers to draw eyes and beak on each M&M. Arrange birds in nest. This entry was posted on Monday, August 17th, 2009 at 1:05 pm	and is filed under animal cupcakes, bird cupcakes, spring cupcakes. You can follow any responses to this entry through the RSS 2.0 feed. Responses are currently closed, but you can trackback from your own site.